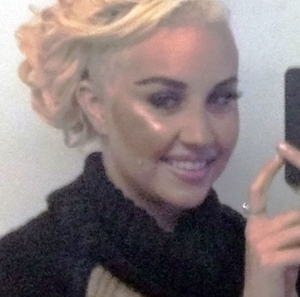 Former friends of Amanda Bynes give an insider's view of Amanda's drug fueled party lifestyle. As late-night revelers opened the door to Amanda Bynes’ large but sparsely furnished NYC apartment for an impromptu party, they were shocked by what they discovered inside. Exclusive photos obtained by In Touch appear in this week’s issue, exposing the troubled star’s partying life. Photos taken inside her apartment during a long night of partying reveal her disheveled living conditions, and Amanda herself atop a bare mattress, smoking a joint and obsessively refreshing her phone’s Twitter feed. She is also pictured applying her makeup and dancing (much like her infamous "getting-ready" Twitter video that went viral), with a strange man “dancing behind her, and smoking weed with her,” says “Joe” to In Touch, a photographer who was inside Amanda’s apartment that night, who doesn’t want his real name used. Drug claims aside, it would be hard for Amanda to deny the conditions in which she lives. “Her living room is basically empty,” describes “Joe.” Blinds hang on three windows near her bed, while the other windows are spray-painted black. After her impromptu photo shoot, of which "Joe" says, “Her dress was tight and sheer and you could see her bra — she seemed to like that,” the party continued into the wee morning hours when Amanda kicked her guests out around 5 a.m.
Any psychiatrist would tell you heavy drug use is a mental disorder. When are people going to learn smoking, drinking and recreational drugs have long term effects. Marijuana has three times the amount of tar which is also found in tobacco. Whitney Houston had emphysema. She smoked it constantly. I had a couple of friends who swore by it. One fool took two hours to get home. He couldn't remember where he lived. Another friend died from being bitten by a brown recluse. He would be here today if he paid attention to his body. His weed was important. The devil loves his job.